1. To make the jelly, put the ginger juice into a small pan and bring almost to the boil. Meanwhile, put the fruit cup into a pan and boil for one minute. Add the warm ginger juice and the ginger ale to the fruit cup, and mix until all the ingredients are combined. Boil for a few minutes, then add the gelatine leaves. Stir until fully dissolved, then add the lime juice. Set aside, but don’t let it go cold. 2. To make the panna cotta, place all the ingredients, except the gelatine leaves, in a pan over a medium heat. Once hot add the gelatine leaves, and mix until the gelatine is fully dissolved. Set aside, but don’t let it go cold. 3. To make the strawberry syrup, place the strawberries in a pan. Add the fruit sugar and orange blossom water and mix together. 4. Place the pan over a medium heat and allow to come to the boil. Once boiling, reduce the heat to low and simmer for 30 minutes, stirring occasionally. 5. Sieve the strawberry mixture, reserving the liquid and discarding the rest. Place the liquid back in the pan and allow to simmer for 10 minutes. Put aside to cool. 6. To assemble the trifles, put four strawberry halves in the bottom of each tumbler, then add the fruit cup jelly mix and refrigerate until set. 7. 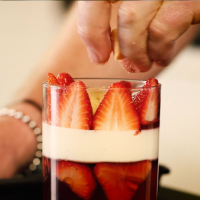 Once set, add the panna cotta layer and place back in the fridge to set. 8. Place six strawberry halves, cut side to the glass, around the inside of each glass. Scatter over a little of the crumbled shortbread, drizzle with strawberry syrup and finish by sprinkling some of the freeze dried strawberries over the top.